Move over LeBron James, “Fancy Chief Clancy” is just waiting for his big contract and then he will just tear that court up! What is Rally Obedience? Imagine being in the competition ring and being able to talk as much as you want to your dog, even in your puppy-wuppy voice if you wish! Pat your leg to encourage your dog to stay with you, repeat the commands to your dog if you need to and just be as silly as you want, to RALLY your dog as you follow a course of signs indicating what you’re supposed to do. 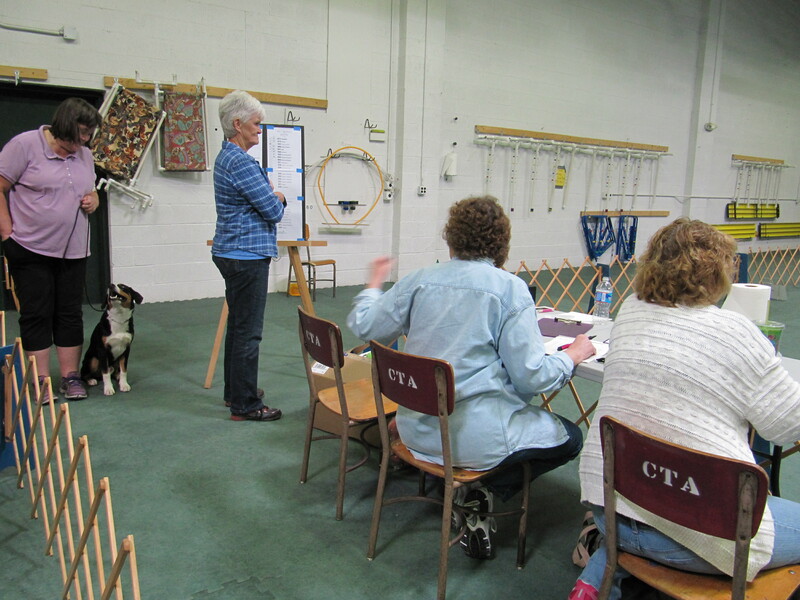 It’s so much better than trying to remember an obedience course and listening to a judge telling you what you should do. You can even say “re-do!” when you know you’ve messed up and want to re-do the station. Rally should be fun and encouraging! 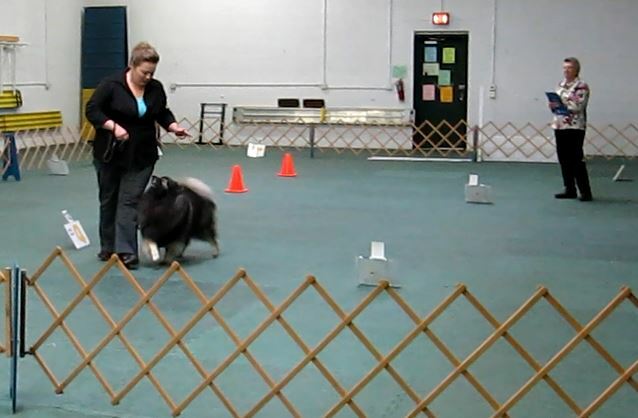 Clancy and I working as a team in our first AKC Rally trial. That’s what makes Rally Obedience fun and a great way to either start in or enhance your teamwork skills to improve in any dog sport. Rally is a relatively new dog sport focused on success in obedience in a more relaxed setting than regular Obedience. It is offered by various governing bodies. Clancy and I compete in both the American Kennel Club and the United Kennel Club since that’s what’s offered in our area. 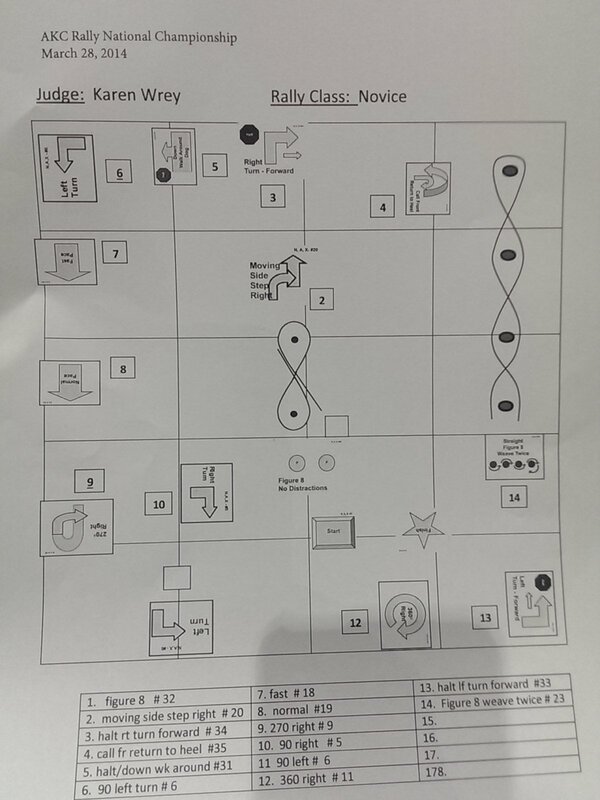 In Rally, there is a course composed of signed stations that tell you what to do. 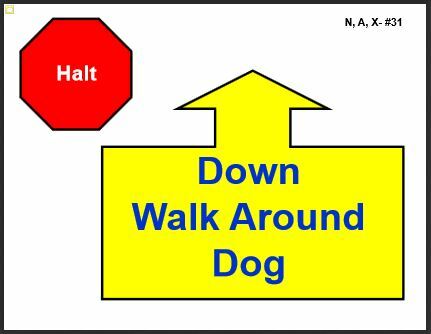 Your dog heels beside you as you approach the signs that range in telling you to turn in a specific direction, circle, or giving your dog a command or series of commands. Clancy loves that we can have fun together through the excitement of my voice and the encouragement in moving my arms. I enjoy the challenge of having to quickly read the signs and remember what they said… having to ensure I complete all parts of the station while being mindful of my positioning… and being sure to sound upbeat and positive to keep Clancy motivated! 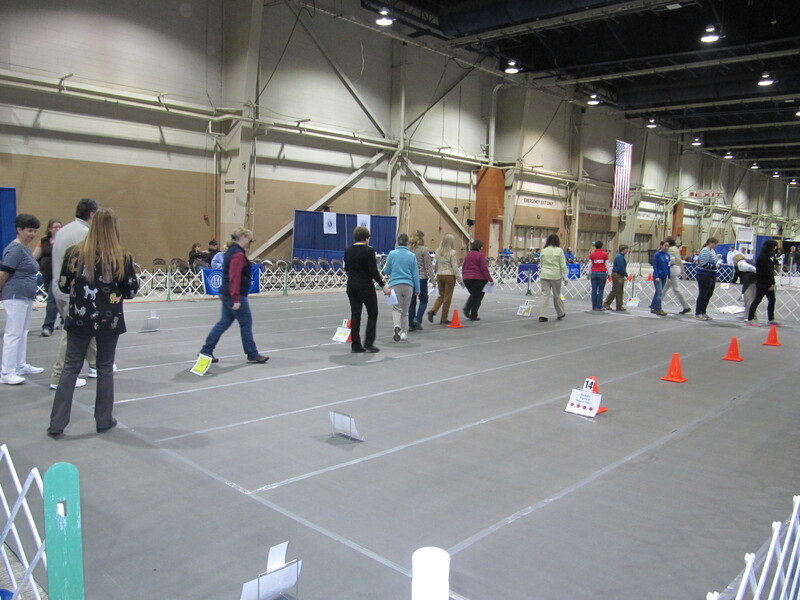 You get to walk through the course before your competition level begins and ask the judge any questions! The ring steward will call you “on deck” when you are next to enter the ring to be sure you are ready to approach the “Start” sign as the previous dog exits the ring. A Rally exhibitor on deck to go in the ring next. When you approach the “Start” sign, you have your dog sitting (or standing) to your left in heel position. The judge will ask “Are you ready?” (now take a deep breath and make sure your dog is focused on you), and when you reply, “Yes”, they are able to start judging you and you can no longer touch your dog. The judge will say “Forward” and you then tell your dog to heel as you head to the first station. A timer begins as soon as you pass the “Start” sign. 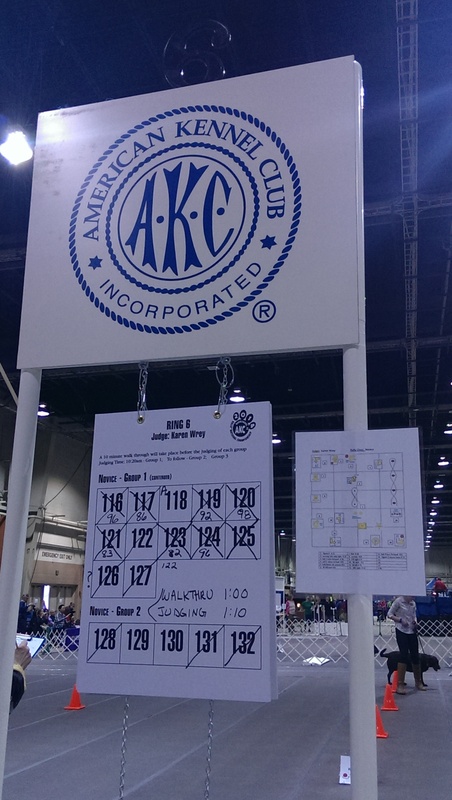 In both the AKC and the UKC, you begin the course with the perfect score of 100 points. Points are deducted throughout the time you are in the ring anytime you and your dog are not exhibiting the ideal vision of a Rally run. These could include if your dog is lagging behind while heeling (though it is nice that unlike traditional Obedience, they aren’t looking for “perfect heel position”), not responding to a command or taking an excessive amount of time to obey your command, or handler errors such as having a tight lead, slowing to the dog’s pace, performing part or all of a station incorrectly, touching your dog, etc. Scores are posted next to your armband number after your run. Times are not disclosed until after placements have been announced. A qualifying score in the AKC and UKC is 70 points. At any point during the course your deductions put you lower than the 70 points qualifying score, you are then marked “NQ” and are excused from the ring. Sometimes, depending on the judge and how busy the schedule is, they may let you complete the course as a training opportunity. At the end of each Rally level, the judge will ask all those that received a qualifying score back into the ring to award them all a Qualifying Score ribbon, which also means you earned a “leg” towards that level’s Rally title. They will also award those that received their third “leg” a ribbon for receiving a new title. The judge will then announce the 1st place, 2nd, 3rd and 4th place winners based on the highest scores. If there is a tied score, the tie is broken by whoever had the fastest time (which is the only reason they time you.) Only twice has time been a factor for Clancy and I… which is suspenseful because while you can see what everyone’s score is ahead of time, you don’t know the times and just have to wait to hear the placements from the judge. If the judge isn’t too busy, you may approach them after the awards presentation for your class and ask them what stations did you lose points on so you know what you need to work on for next time. Clancy and Stacie earn their AKC Rally Novice title and 1st place! Rally Obedience is a fun way to train your dog obedience and a variety of additional listening skills, for there are a large variety of exercises and many of them defy the set traditional Obedience exercises. 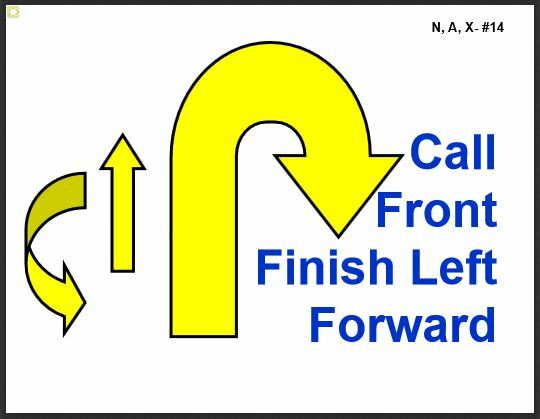 For example, the “Call Front, Finish Left, Forward” exercise. While you are heeling, you tell your dog to “come front” where they walk past you and do a U-turn to sit directly in front of you. You then tell your dog to return to heel position by doing another U-turn on your left, HOWEVER, unlike traditional obedience where the dog should immediately sit on your left automatically, you start moving forward as soon as your dog clears your path before they had a chance to get into the heel position, which makes the dog have to catch up to you to heel by your side. Some of the signs can be difficult to understand which is why it’s always good to either take a Rally Obedience class or participate in “run-thru’s” which are often held by local dog training or kennel clubs (often you don’t even have to be a member, you just pay a fee to do a run-thru and instructors or knowledgeable volunteers will answer any questions you have and correct you if you make a mistake.) Join Clancy and I for Rally Run-thrus! Check out our FUNanimal Meet-up Group. Well, I could go on and on and on about Rally Obedience (and I will), but the goal of this article was to introduce you to this fast growing sport that serves not only as a wonderful foundation to get you ready to compete in other dog sports, but it is a fun way to train your dog to want to listen to you and strengthens your bond. I also find that Rally Obedience offers new challenges you don’t see in other dog sports. Having to focus on the signs and remember exactly what they said (it’s an entirely different experience in the competition ring… you and/or your dog may suddenly seem like you’ve never done it before… the sign says do a circle to your left and you circle to your right, or the dog doesn’t seem to remember what “sit” means). Clancy tied for 1st place in Rally Advanced, however we had the slower time so we took the 2nd place honors. Not to mention all the distractions you could encounter in the competition ring that you don’t see in practice runs or at home. Such as a wooly caterpillar crossing your path so your dog stops heeling to investigate and finds it more interesting than listening to you… (ahem, Clancy!) Or new smells draw your dog’s attention away from you, or loud noises, or just other dogs. That’s why it is best to practice random exercises during your travels with your dog. While you’re shopping at the pet store together, suddenly do a “come front, finish” exercise… while you’re taking a walk past a barking dog behind a fence, suddenly do a 360 degree turn while telling your dog to look at you instead of the barking dog. Repetition, repetition, repetition in a variety of settings with a treat that you can give your dog quickly (and that they can consume quickly) as soon as you get the desired behavior from your dog, will eventually get you to where you want to be. The more you do it, the better you’ll both get! Do not give up on your dog! Even spending just a couple minutes every day practicing a move or two will make you a better team! Being owned by a Keeshond, I have learned you also need to share in the sense of humor they have. They are fun-loving dogs that want to please you, but also just want to have fun. Especially with emotional breeds such as the Keeshond, Rally Obedience is a wonderful way to increase your dog’s focus, your trust and bond, and enhance your training while meeting lots of great people! P.S. Look for future blogs targeting the different levels of Rally Obedience. 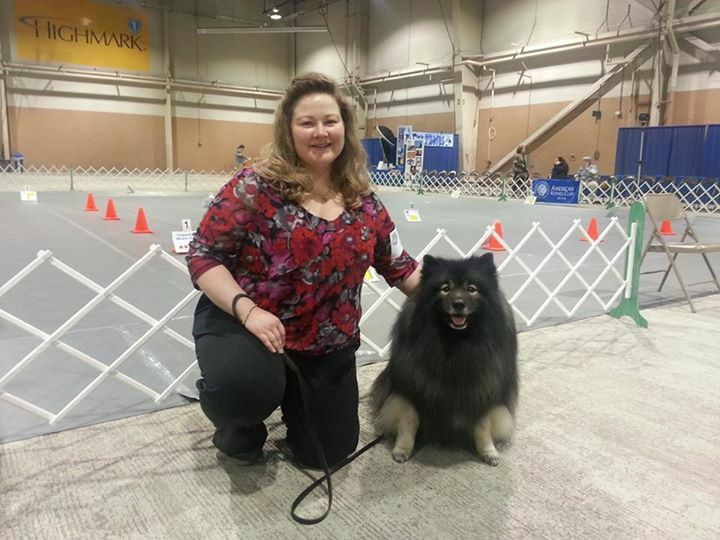 ALSO, Coming Soon: I will share my experience of competing in the AKC Rally Nationals Competition in Harrisburg, PA with Clancy that was on Friday, March 28th! Thanks for reading! 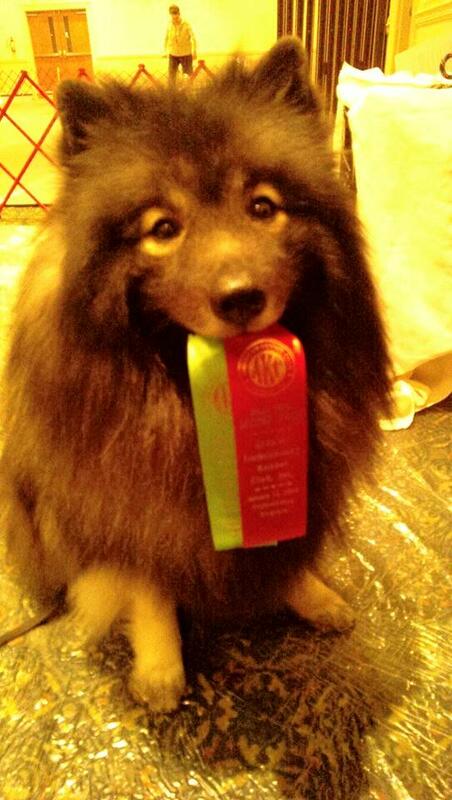 Categories Dog Sports, Uncategorized, Videos starring Clancy the Keeshond!